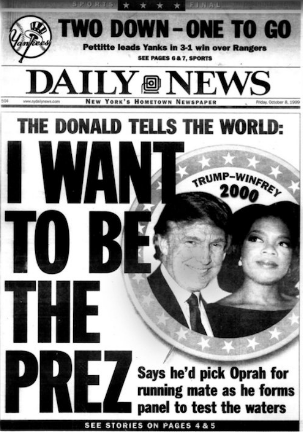 In 2009, Donald Trump said his ideal running mate would be Oprah Winfrey. The actress used her acceptance speech for receiving a lifetime achievement gong at the Golden Globe Awards to tell a room full of her peers (including the cheaters, narcissists and SADOS – Sons and Daughters of Stars ) that the time for social change for nigh. Oprah for President, came the media response. and the job is surely hers should she give away a free car with every vote.